Yahoo! 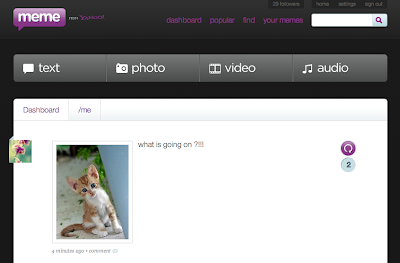 Meme was launched as a new micro-blogging platform that has invaded the cyberspace in August 2009. Starting out in Spanish, Yahoo! Meme English was also created to appeal to the bigger crowd of internet addicts. Now, the said platform has already 5 languages including Portuguese, Bahasa Indonesia & Chinese. During the Christmas party of Blogs4Reviews that was held at Le Bistro cafe in Makati City, Jonas delos Reyes of Yahoo! Philippines shared to us an update of Yahoo! Meme as an emerging micro-blogging platform. He said that the Philippines is lucky to have experienced it first in Asia and one of the firsts in the world in September 2009. Thus, I created my own account: Arvin's Meme. The site is still on its beta testing stage and yet has already drawn thousands of delighted users. A "meme" is commonly known in the web as some kind of content that spreads fast and draws everyone's attention. The term itself was created by Richard Dawkins and published in his book "The Selfish Gene" in 1976. It refers to a specific fragment of culture or behavior that's multiplied between individuals, similarly to what happens with genes in the field of biology. Meme from Yahoo! hopes to be an efficient "memeplex". In other words, somewhere to multiply and distribute fragments of information. These fragments, or "memes", travel from one person to another and survive through their own merits or circumstances. They evolve, suffer mutations and some may even get to be very famous. What I like about Yahoo! Meme is that it's easy to repost what has been posted by others - whether it is a photo, a video, an audio or a text. No need to copy & paste. You just need to click the repost button (the purple clockwise arrow button) and automatically it shows up on your dashboard/ meme page. Definitely, there are so many things to share to the whole world and I'm happy to see amazing and funny photos. I also use it whenever I have new blogs to promote. With its easy repost feature, can you imagine how one post can reach hundreds and thousands of people across the globe? More importantly, it's very user-friendly. Whenever you post something, you don't need to worry where it will go or how far the mile it travels because Yahoo! Meme credits the original owner of the post. And there's also a frequency count on how many times your post has been reposted by others. Isn't that wonderful? 4. Change theme by choosing from a long list of Yahoo! Meme layouts. 5. 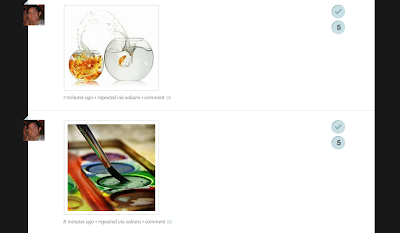 A collage summary/ history of posts done according to categories: Photo, Video, Audio & Text. More power to Yahoo! Meme. I wish to have more friends connected on Yahoo! Meme. 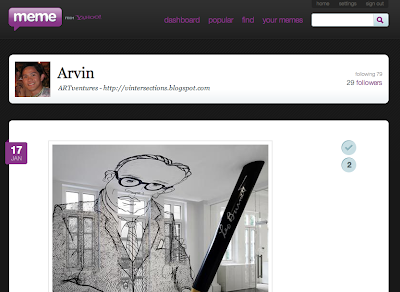 You may add and follow me: Arvin's Meme and I promise, I'll follow you back. Hi Arvin. I always enjoy your Yahoo Meme finds. I also encourage you to use that to share photos with links to your blog post.